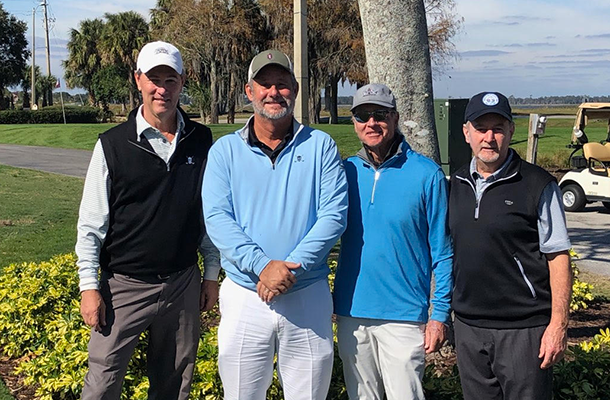 WINTER HAVEN, Fla. - The Four-Ball Winter Series event saw many red numbers across the leaderboard at The Country Club of Winter Haven. The teams of Finster/Keenan, LaCrosse/Kerper, and Watson/Stone earned victories, defeating tough competition. Brian Keenan, of Saint Petersburg, and Mike Finster, of Tampa, posted the tournament low round to claim a wire-to-wire win by six strokes. Finster and Keenan opened the winter series with an impressive 63 (-9). Together the duo scored an exceptional nine birdies and with an eagle from Finster on the 18th hole, the team took the early lead by five strokes after round one. A finishing round of 67 sealed their victory, at 130 (-14), over a field of strong competition. Ponte Vedra residents, Chad James and Paul Tesori, posted two consistent rounds of 68 to finish tied for second place, six strokes behind at 136 (-8). A comeback round of 66 on day two moved the team of Kevin Dutkowsky and Paul Royak, of Tampa, to tied for second place. Consistency proved to be key as Andy Green and Ryan Roberts carded two rounds of 69 to finish in fourth place at 138 (-6). A birdie on the fourth playoff hole crowned Doug LaCrosse and Richard Kerper Senior division Champions. 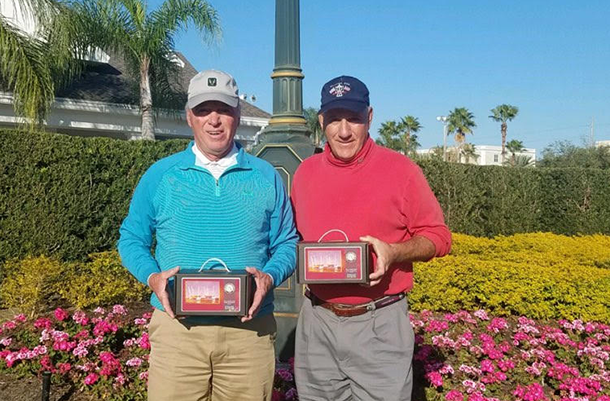 Kerper, of Tampa, and LaCrosse, of Oldsmar, played steady golf with rounds of 70-69 to tie the team of Cash Wiseman and Len Cole for first place after the final round. Wiseman, of Lehigh Acres, and Cole, of ChampionsGate, made a total of 10 birdies to advance to the playoff. Four holes later, and a birdie from LaCrosse, earned the team of Kerper/LaCrosse a victory. Rounding out the top three was the team of Edward Parnell and Chip Peterson who posted an impressive first round of 67 to finish at 141 (-3). Carey Watson and Jim Stone eliminated a two stroke deficit after round one to capture first place by three strokes. Stone, of Bradenton, and Watson, of Plantation, never let a tough hole break their fire as they posted seven birdies in their final round to finish with a 68 (-4) and tournament total 138 (-6). Round one leaders, John McCreary and Thomas Jung, followed a 68 with a round two 73 to fall to tied for second place at 141 (-3). The team of Bruce Moskovciak and David Hawkins hit red numbers in round two to tie McCreary and Jung in second place, 72-69—141 (-3). Fourth place was claimed by Pete Andrews and Lenny Barthle at two-under par, 142. Entries are open to male amateur golfers who are age 25 or older as of February 26, 2019 and a Regular or Foundation Member of the FSGA. Late entries will be accepted subject to a $10 late entry fee should the entrant gain acceptance into the field. Age-group Champions at each event will receive a commemorative award. Gift certificates (totaling approximately $30 per-player in the field) will be awarded to the top finishers in each age group. There are three age divisions; Mid-Amateur (25-54), Senior (55-64) and Super-Senior (65 & above). A player and his partner can be of any age, but the team will compete in the division of the youngest player's age as of February 26, 2019. Points earned by each competitor will remain in their actual age group. Both team members must play from the same tee. **After the first round, each age division may be flighted based on the number of competitors and/or the range of scores. Practice rounds are available one week prior to the event on a space available basis. Practice rounds are restricted until after 12:00 PM on weekends. To arrange your practice round please call the club at 863-324-4579. The cost of a practice round is $40 plus tax.